Virtual electronic assistants such as Amazon’s Alexa, Google Home or Apple’s Siri have become increasingly popular. These little devices have already shown that they can be quite useful in a number of different tasks, but more recently, healthcare providers have begun exploring their potential uses in medicine – especially in the area of home care. The capabilities of virtual electronic assistants have led many to argue that these devices can replace home care assistants. Their abilities to promote independence, reduce feelings of isolation and regulate living spaces have offered patients more autonomy than ever before. 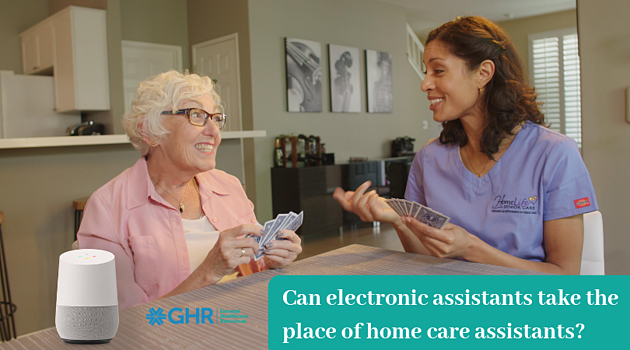 While these devices undoubtedly offer unprecedented levels of self-sufficiency among patients, the idea that they can effectively replace a home care assistant isn’t entirely accurate. There are a number of reasons why virtual electronic assistants are not able to take the place of home care assistants. Virtual electronic assistants can certainly help a patient connect to the outside world. They make it easier to place phone calls, order goods and services, and connect with loved ones. This virtual connection is important, but there is something particularly valuable about a daily interaction with another individual, especially when the patient has a limited ability to leave their home. Virtual electronic devices do not have the ability to carry on a conversation or offer human contact like another person can, and there’s nothing that truly compares to that sort of interaction. While it is true that some of these devices have the capacity to help patients keep track of prescriptions or monitor health trends, they simply do not have the same training and experience that a home care assistant has. Home care assistants are more attuned to noticing positive or negative trends in an individual’s care and can respond more appropriately than a machine can. Additionally, home care assistants have medical training that can help an individual in an emergency situation. These benefits are irreplaceable. When it comes to home care, many specialists would agree that it is extremely helpful to provide patients with a daily routine to instill normalcy in his or her life. A virtual electronic assistant can play helpful roles in that routine. However, daily routines can sometimes skip a beat, which requires others to be able to respond and adapt accordingly. Devices like Google Home and Alexa lack that adaptability and ability to respond, making them not as valuable as a home care assistant. In some cases, patients go from being completely self-reliant to completely dependent on others for survival. This can understandably be a crushing blow to an individual’s confidence. Virtual electronic assistants can play a significant role in helping these patients regain some control in their lives, and therefore help rebuild that confidence. Not all patients are thrilled about the idea of relying on a home care assistant to get through the day. However, virtual electronic assistants can act as an ideal form of compromise between difficult patients who crave independence and home care assistants who are trying to diligently perform their job duties. Virtual electronic assistants can increase self-sufficiency, and therefore decrease reliance on an assistant. A patient may become more comfortable with their daily tasks while the home care assistant is available to tie off any loose ends in their daily tasks. As we have mentioned, virtual electronic assistants provide patients with newfound independence and confidence. These are benefits in and of themselves, but they also allow the home care assistant to spend more time focusing on providing care and performing more important tasks, such as monitoring the patient’s health and maintaining the household. That saved time can be spent doing other valuable things, such as simply talking with a patient and building a positive relationship with him or her. While electronic assistants cannot replace the hard work that home care assistants provide, they can assist them by bringing many benefits to a patient who is in the process of rehabilitation, or who just needs a little extra help day to day.